If there is one element of interior design that creates a “wow” factor for visitors, it is furnishings. When people enter a community and see expertly arranged chairs, sofas and tables in a lounge area, it leaves a positive, lasting impression. And it can go a long way in attracting new residents and gaining a competitive advantage. But furnishing a community goes beyond the initial encounter. That same “wow” factor also should extend into resident rooms, dining areas, corridors, outdoor areas and even utility rooms. Furnishings also should provide more than aesthetic appeal, manufacturers say. For instance, Anna England-Chaney, designer for Flexsteel Industries, says her approach is to incorporate a “cross-application” between form and function. As long-term care facilities have become more hospitality-oriented with independent and assisted living models, the role of furniture has taken on a much more prominent role in the décor and as an amenity for residents looking for relaxation and comfort. Andrew Christmann, marketing manager for Hekman Contract, says manufacturers serving the healthcare and hospitality markets tend to focus on making products for group usage, but that doesn’t mean they don’t take individuals’ needs seriously, either. The contemporary movement toward person-centered care in senior living has motivated furniture suppliers to transition away from stereotypical, commercial-looking designs and toward creating an at-home experience, says Dean Jarrett, director of marketing for H Contract. Common areas — foyers, lounges, dining areas and meeting rooms — are where furnishings are most visible and where the most pieces are required. Fully furnished common areas typically will have chairs, sofas, recliners, benches, pillows and tables, as well as lamps and other lighting fixtures. Besides beds, resident rooms need chairs, tables and case goods. Office areas need desks, chairs and tables. At Flexsteel, England-Chaney says the company takes a holistic view of the facility in its commercial approach. Christmann says that if there’s one room where the “wow” factor is essential, it’s the dining area. Fashion is fickle by nature, and what’s “in” for a time also can go “out” in a flash. The worst furnishing faux pas is to purchase a style that looks dated after a short time. To avoid falling into a “trendy trap,” manufacturers say facility operators should trust the design staff’s sensibilities on the issue. 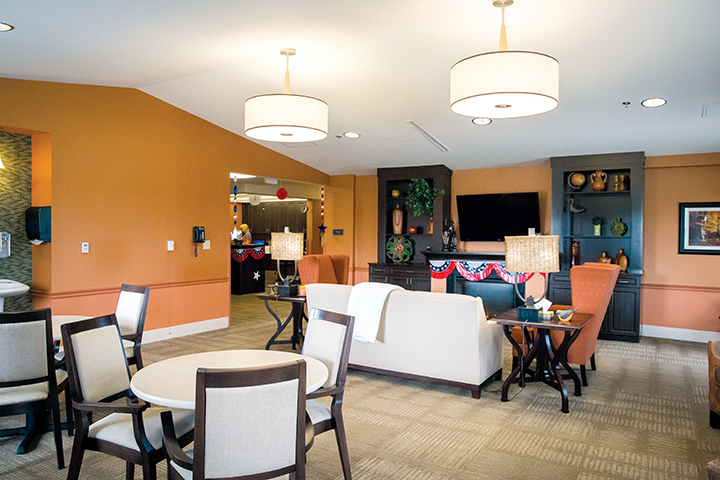 John Martin, founder of Martin’s Chair, says the traditional style is perfect for senior living communities because it gives residents a feeling of being at home and offers them a sense of ownership. When considering the design, form and function of a room, it is important to include walls and floors in the equation. Although not considered furnishings in a conventional sense, wall treatments and flooring options complete any room’s design scheme, industry stakeholders point out. With regard to flooring, facility operators also should be mindful of other associated costs that can be unforeseen, such as slip-and-fall injuries. To reduce potential slip-and-fall events, operators should consider a flooring that is both slip-resistant and helps reduce noise in a space, Bethel says. “Should they occur, falls can be less severe on a soft surface versus a hard surface, as a soft surface is better at absorbing the impact of a person’s fall,” he says. Wall coverings have advanced to provide bright aesthetic qualities to a room’s look as well as providing more durability than paint, says Clarence Porch, director of national accounts for Koroseal. Digital printing allows facilities to apply custom designs and patterns to the walls, and templates enable sections to be replaced with no discernable difference, he says. Design themes and stylistic continuity are considered by most professionals to be unifying forces in the overall facility décor. Yet some say the rules can be bent, even broken, and that conformity shouldn’t be the overarching concern. The younger Martin contends that the best way to ensure consistency is to work closely and collaboratively with the furniture manufacturer. Conversely, Christmann believes that design consistency is less important these days.